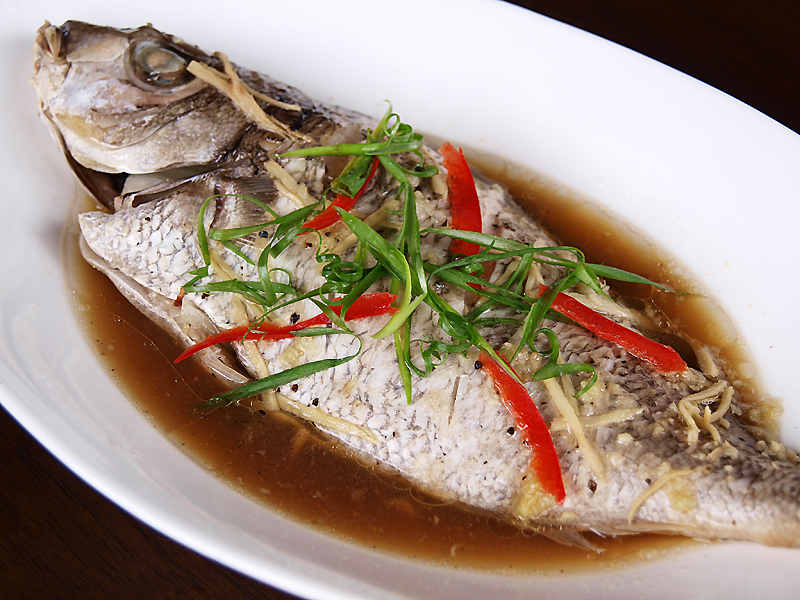 Steamed fish in Chinese cuisine is very common, in fact it is one of their favourites and this is evident in most Asian restaurants as it is a common sight in almost every table. This might look intimidating at first but this recipe is really quick and easy to prepare but it has its secrets to achieve the similar results you see served in Chinese restaurants where the fish is juicy, sticky and flavourful. I made a lot of this and I learned my lessons and through past experiences and observations I perfected making this at home so here I am sharing to you how to achieve the Chinese restaurant quality steamed fish. You really need to have a high temperature steam to cook the fish quickly as steaming it for prolonged time will make the meat tough and dry rather than juicy. The plate where your fish will be steamed should be semi shallow which will act as the catch basin for all of the juices that comes from the steam. You don’t need a steamer, in fact a large wok with cover is the best for making this dish, just use a round quiche pan with removable bottom to hold your ovenproof plate with the fish. Just remove the bottom and fill the wok with water. When the fish is ready to be served, a scoopful of very hot combination of peanut and sesame oil is poured into the top of the fish. In a bowl combine spring onions, ginger, garlic cloves, chilli, light soy sauce, Chinese cooking wine, 1 tbsp of sesame oil and brown sugar. Pat dry the fish with paper towel inside and out then using a knife to cut 3 slashes on each side of the fish. Place 1/3 of the mixture in a plate then place fish on top, place the 1/3 in the fish cavity and finally the 1/3 on the top. Place plate in a large bamboo steamer or if you don’t have any large steamer that will accommodate the plate. Now add enough water to the wok then bring to the boil in high heat. Place the bamboo steamer over the wok then steam covered for 10 minutes or until the fish is nearly cooked, do not overcook, the cooking process will not end once you stop the heat as there is enough heat left on the fish meat to cook the remaining. While the fish is steaming heat the peanut oil together with the remaining sesame oil in a saucepan, heat until it nearly reaches its smoking point. Drizzle hot oil over the fish then serve immediately. I have never steamed fish before – your recipe sound wonderful. All my favourite flavours. This is so popular at Malaysia, almost all Chinese restaurants serve this, its nice in taste too, esp with the ingredients inside. On a healthy side being steamed, yummy yummy. This is one of my favourite ways of eating fish – so healthy and delicious. And in Sydney you could even find “seafood soya sauce” in the Chinese supermarkets which makes it even easier. Weirdly I can’t find it here in Singapore very easily. My husband bought me a bamboo steamer…I think I may have to try using it to make this. I absolutely love Asian Steamed fish! I’m a huge fan of steamed fish but have never made it myself! There should be a printable page of this recipe that excludes the rest that doesn’t relate to the recipe.